Halloween is almost here, which means it’s time for spooky stories, haunted houses, and creepy treats! 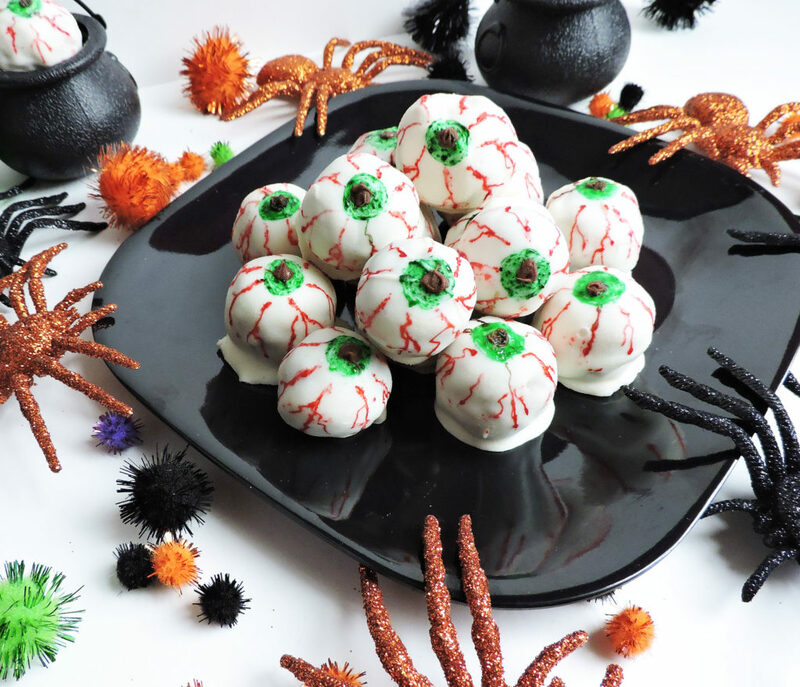 These Spooky Energy Eyeballs are made with wholesome ingredients making them the perfect Halloween treat! It’s Friday the 13th, y’all (cue the scary ‘Jason is coming’ music)!! On Friday the 13th, I instantly think of Jason and that creepy music that is ONLY played when he is anywhere close by! I never understood how he seemed to catch up with his victims by walking slowly when they were frantically running…maybe he just took really big steps?? Lol. Well I simply adore the Halloween festivities! Not the really scary parts because I’m a true scaredy cat, but the fun parts like the Halloween festivals, the cute costumes, and the fun treats! In honor of Friday the 13th, I wanted to make a spooky treat for my littles but I really didn’t want to load them up with tons of sugar, because we all know that tons of sugar usually means no sleep for mommy! I often make energy balls for my kids as a quick snack or for a quick breakfast. 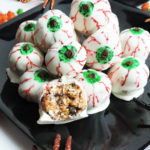 They LOVE mommy’s energy balls, so I thought that it would be neat if I could turn this into a scary little treat! I whipped up a batch of cranberry and chocolate energy balls and dipped each ball into melted white chocolate. I put the balls in the fridge for a few hours to set. After the balls set, I made “food paint” by mixing one teaspoon of lemon extract to each little bowl of red and green food coloring. I mixed those ingredients and added more food coloring until desired color concentration was reached. I dipped the pointed end of my wooden skewers into the green food paint and drew green circles on top of each ball. This is the eye. Then I dipped another skewer into the red paint and drew squiggly lines, starting from the green circle to form “veins.” Keep in mind that your eyeballs don’t have to be perfect. A few imperfections will only add to the gruesome effect! You may want to put the balls into the fridge to set a little bit after you finish drawing on the eyes and veins. Place oats, honey, peanut butter, mini chocolate chips, dried cranberries, flax seeds, and vanilla in a medium bowl and stir to combine well. The mixture should be a bit sticky. Refrigerate for at least 30 minutes. Using a small scoop or tablespoon, scoop mixture into your hand and roll into a ball. Repeat with remaining mixture. It helps to slightly wet hands when rolling the balls to prevent mixture from sticking to hands. Refrigerate the balls for about an hour. 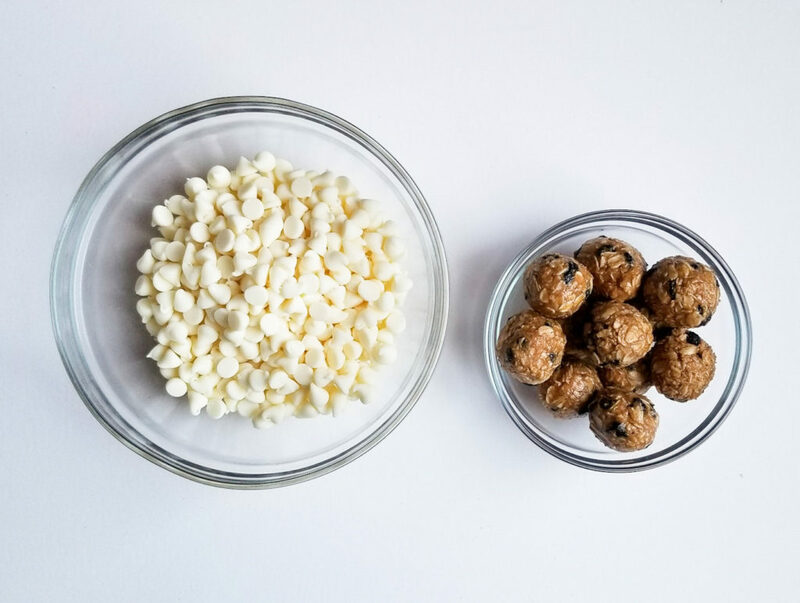 When balls are firm, melt white chocolate in a small microwave safe bowl for about 1 minute or until melted. Stir in coconut oil. Dip each ball in the white chocolate mixture and set on parchment paper to set. Place in refrigerator to make sure the white chocolate has completely set. Take 2 small bowls, and add red food coloring to one and greed food coloring to the other. Add a teaspoon of lemon extract to each bowl and feel free to add a few more drops of food coloring to reach desired concentration. 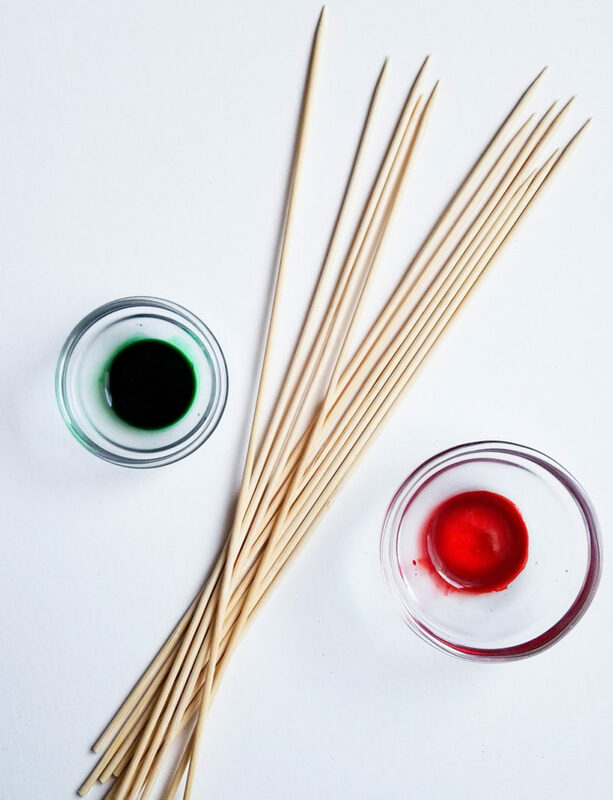 Using 2 wooden skewers, draw green circles on the top of each ball and red “veins” extending from the green eyes. Melt milk chocolate chips in a small, microwave safe bowl for about 1 minute. Using a wooden skewer, place a dot in the center of each green circle to make pupils. 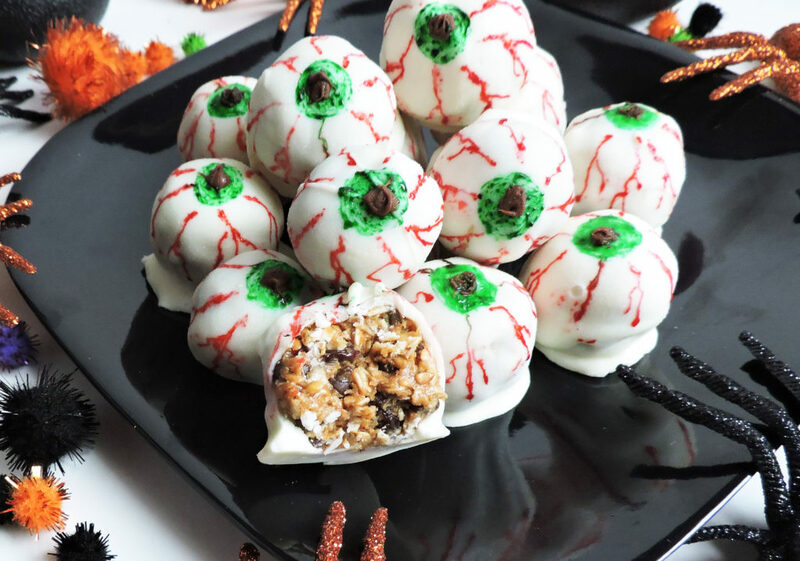 Keep eyeballs stored in the refrigerator until ready to serve. Thank you! I hope that you and your family will enjoy them!! Hey Y’all and welcome to Beautiful Eats & Things! My name is Andrea, but you can call me Andy! 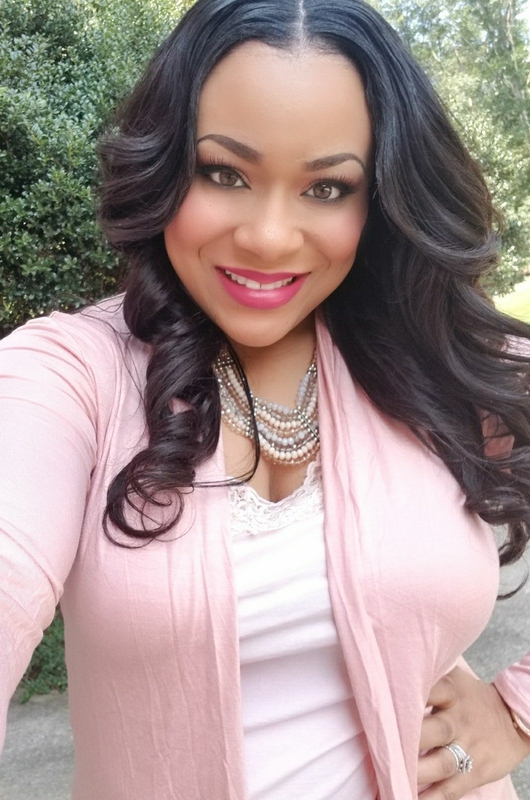 I am a Southern, Food Lovin’ Wife, Mommy and Registered Dietitian who is obsessed with all things beautiful; especially beautiful food! 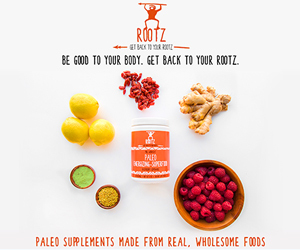 My passion is creating healthy and wholesome recipes that are easy, practical, and delicious! Take a look around my site and you will find a plethora of interesting things; from yummy recipes to crafting/DIY projects, and of course my chaotic adventures with my hubby and adventurous little boys! Hope you enjoy! Subscribe today and get your FREE Ultimate Weekly Meal Planner AND Grocery List!!! Get your FREE Ultimate Weekly Meal Planner AND Grocery List! !